Discuss the importance of balance and barefoot training. 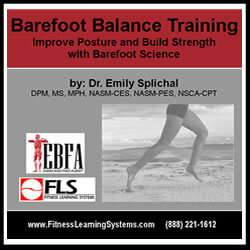 Describe 2 factors necessary to integrate barefoot balance training into a client's program. Identify 4 bones and 2 joints associated with the rearfoot. Discuss the role of 6 extrinsic muscles and 5 intrinsic muscles in influencing the subtalar, ankle, and foot joints. Explain 2 kinematic influences on foot, ankle, and hip function. Identify and discuss 4 muscles/muscle groups associated with the hip and how these muscles could affect dysfunction in the hips and feet. Describe how single leg stance training affects stabilization, function, activation and balance in the foot, knee, hip and pelvis. Discuss the role of neuromuscular influences, maintaining balance, plantar receptor sensitivity, and training surfaces on barefoot balance training. Explain how to safely and effectively perform a neuromuscular warm-up, 5 static stabilization exercises, and 6 dynamic stabilization exercises for barefoot balance training.